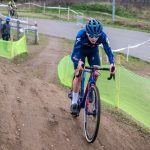 And there was other stuff beyond that – junior racing, exhibitions and so on. Foolishly, I signed up for two of the events, and this year got into both of them. 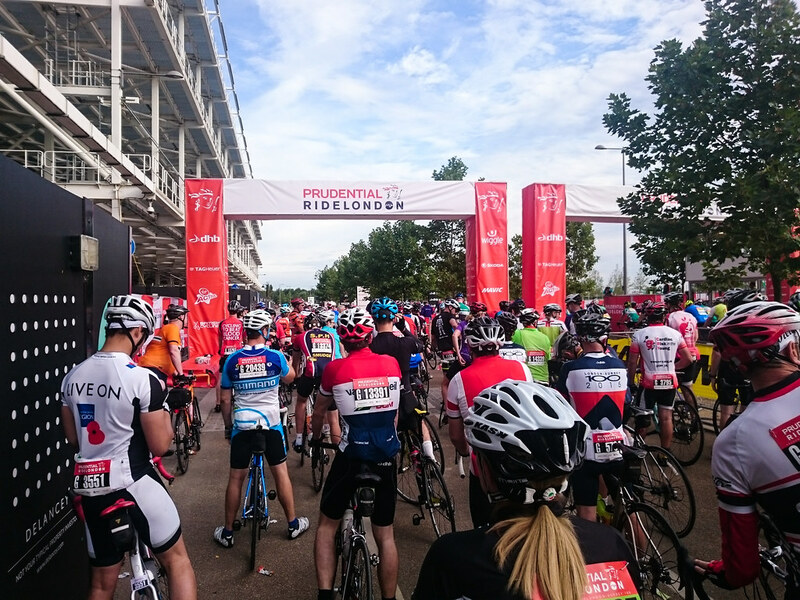 The RideLondon 100 is the big one, and this is its third running, and my third time of trying to take part. It’s a 100 mile sportive and this year I finally got in without having to go down the charity route (access is easier going via a charity, but you must commit to raising several hundred pounds for said charity, which may or may not be easy depending on your personal circumstances). This year was the first that I came up trumps in the ballot. 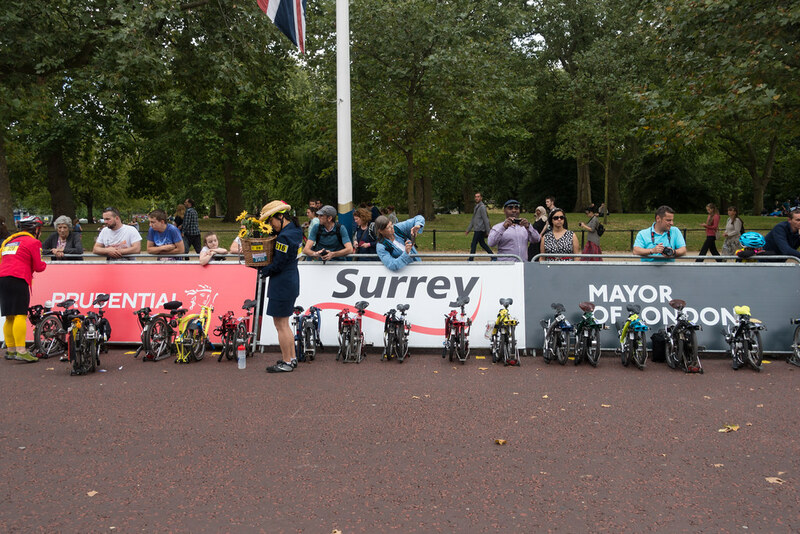 I entered the Brompton World Championships on a bit of a whim with a friend. I didn’t expect to get in, since there are only 500 spaces, and people really do travel from around the world to take part. 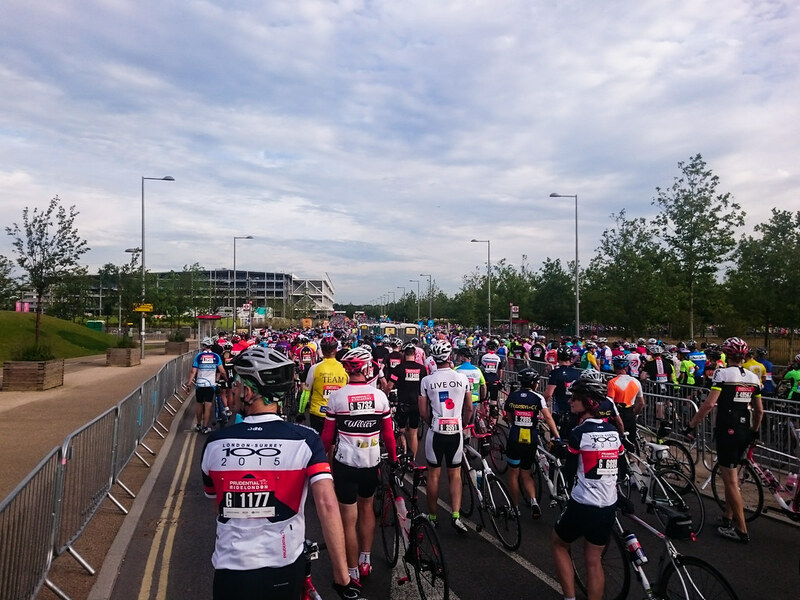 But I did manage to get in, and that had me worried – was it a good idea to do a circuit race the evening before a 100 mile sportive? This weekend was also a bit of a mechanical challenge for me – partly of my own making. On Friday night I decided I should finally fit the rear mudguard for my Brompton that I bought a couple of months ago to replace a damaged one. Replacing a mudguard on a Brompton tends to mean removing the wheel, and because I rarely do that, and it’s more complicated than a regular bike with hub gears, I can have problems. In the meantime, I had sort out my outfit. 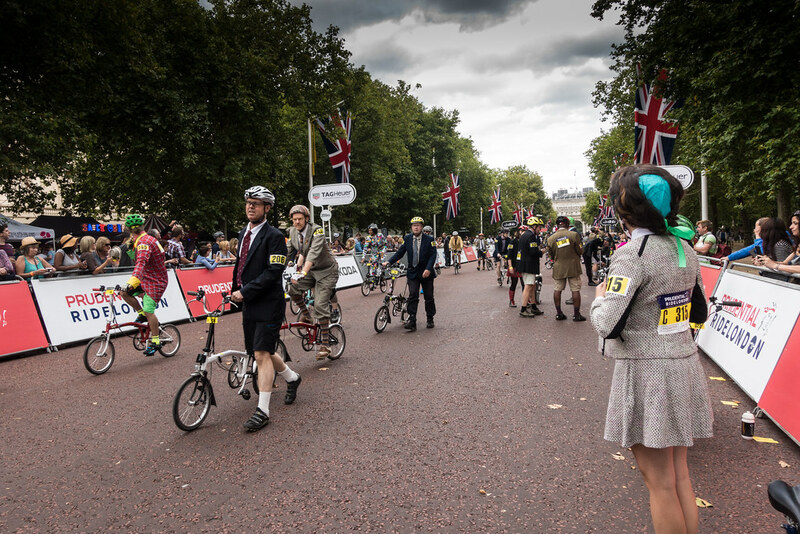 Brompton World Championships rules dictate that you should be smartly dressed with a collared shirt, tie and jacket. Shorts may be worn, but there should be absolutely no visible lycra! I chose an old suit jacket, plain white shirt and a black tie that gave me the look of either someone going to a funeral, or a someone from Reservoir Dogs. I would instantly regret my choice of jacket, since the moment I ventured outside, I realised that it was a lot warmer than I’d thought it’d be. This could be a hot race. The other problem I had outside was that I realised there was a problem with my gearing following my wheel removal. Fiddling as much as I could, I couldn’t sort it. The chain was slipping which wasn’t good. I headed slowly down to The Mall where Brompton had an enclosure. Once registered I looked to find a mechanic who could help me out. He quickly diagnosed my problem – I’d refitted the wheel wrongly. (Note to self: don’t do hurried unnecessary things to a bike the night before a big event). He fixed it, but noticed that my hub’s cones were loose. He didn’t have the right tools, and a Brompton representative suggested that I slowly head over to the Brompton store to get them sorted. I crossed the streams of cyclists on the FreeCycle (many thousands, moving around very slowly), and headed downstairs to the workshop. The mechanic recognised me – I’ve been in a few times – and he very quickly sorted out my hub cones problem and fine tuned my gears. Also downstairs were some Italians riders who were conversing in Italian with the mechanic. Looking at their bikes, I could see some serious speed modifications that they’d made – thin tyres (not my bombproof Marathon Schwalbe monsters), big chainrings, deep-rim wheels and so on. 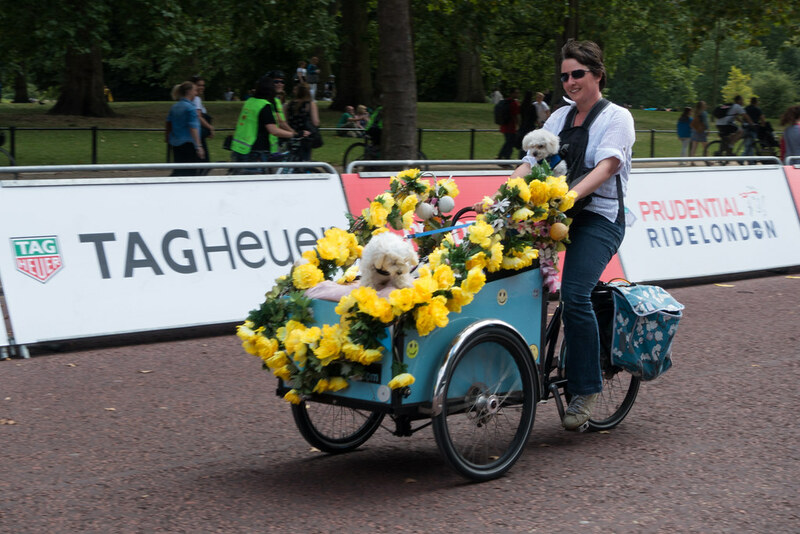 I saw a race number – A4 – which meant this was someone who’d be at the very front and had probably been invited. They were in this to win. Back in the Brompton area we began to ready ourselves. The start would be “Le Mans” style – that is you race to your bike which has to be folded. Lots of people were tactically arranging how to reach their bike quickly. Over the PA system I learnt that ex-pro David Millar was taking part in the race, but that since he’d only got his bike yesterday, he’d not learnt the unfolding technique properly. Some people seemingly practice their unfolding to get it down to 6 seconds. I’ve never “practiced” as such, although I’ve folded down fast as a train approached. We were lined up on The Mall. The course took us down to Buckingham Palace then a left turn around St James’ Park, along birdcage walk and then around until you’re back in The Mall again. A 1.7km circuit in total. There’d be eight laps, although if we were lapped – a highly likely prospect in my case – then we’d finish on the same lap the winners finished. I didn’t expect to race more than about five of the eight laps. I was in the “C” group. We had been grouped according to our expected times. I’d no idea how fast I’d be, but third out of four groups was fine by me. But being further back, we’d leave 20 seconds behind the leaders. The race started and the first group were away, then the second, and then us! I actually managed to get unfolded and away faster than anyone near me, and I was soon flying. After that it all becomes a bit of a whirlwind. Getting into a group would have been the sensible thing, but I always find it hard to get into a group with strangers like that. I slipstreamed a little, and no doubt people were using me to slipstream too. Someone in drag overtook me; I passed someone in full barrister garb. 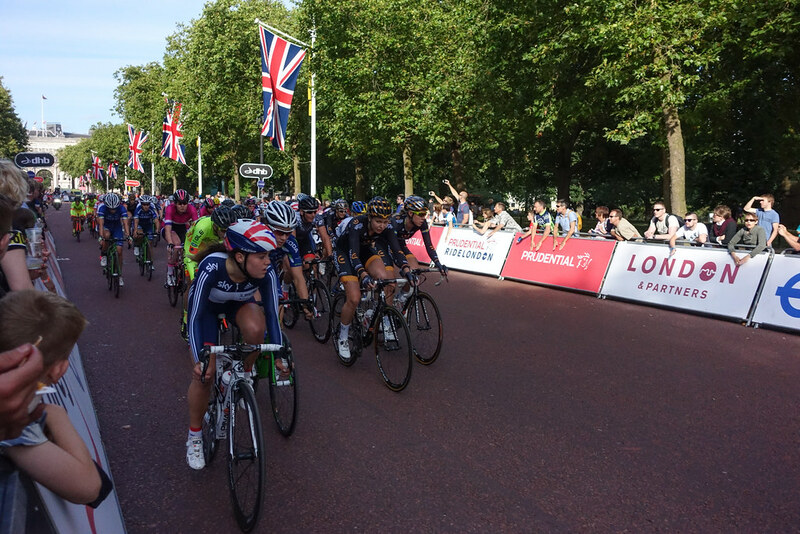 On the corner near Buckingham Palace, the crowds were huge and they cheered us on. After about three laps, I was little perturbed that the leaders hadn’t yet passed. Then they did – flying up on the right hand side along Birdcage Walk. I carried on, with lots of cheers in The Mall where there was also a good crowd. Then I suddenly found myself isolated – nobody close behind or in front. I kept going. My friend then appeared on my right – and I tried to get on his tale. But I lost him on a corner. He’d started behind me so had made good time catching me up. We headed on and on. Another fast group overtook me, but I didn’t think it was the leaders. But I wasn’t sure. I wasn’t really counting the laps, although I was pleased to hear the bell and see one lap to go. I crossed the line with a last minute sprint. When I looked back at my bike computer, it turned out that I had ridden 7 of the 8 laps. The leaders had only passed me once (although they were close to doing so again), and I’d ridden at an average speed of 31kph (19mph). I was happy with that. My lap times – we were chipped – showed me tailing off a little as the event unfolded. And later when the results were published, they showed me finishing 192nd out of 500 riders. I was pretty happy with that. I certainly needed as much water as possible afterwards though. And did I mention the suit jacket was a bad idea? 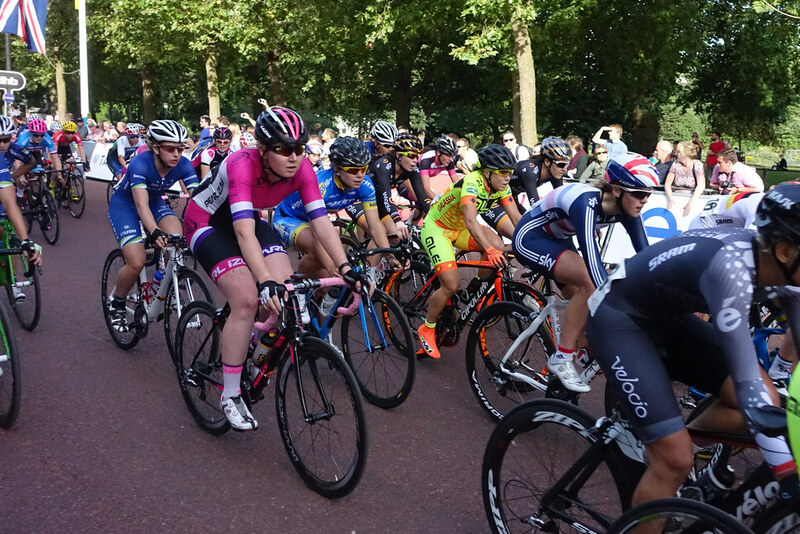 After we’d finished there was a professional women’s road race on the same circuit. The Brompton area afforded good views of the race, and I ignored the presentation ceremonies to watch the race which, despite a couple of escapes, was looking to being a bunch sprint until a nasty crash happened right on the finish line of the penultimate lap. 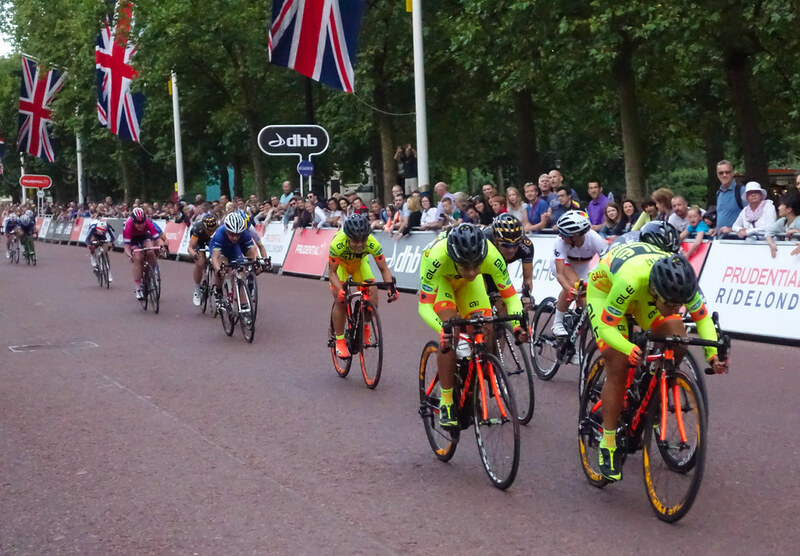 As the remaining riders completed their final circuit, it looked like touch and go as to whether they’d be able to have a sprint finish. But the injured riders were cleared just about in time, and Velocio Sports’ Barbara Guarischi won a tight finish with Ale Chippolini and Wiggle Honda riders in contention. I headed off home before the junior races since I needed to get a pasta meal down me, and a good night’s sleep ahead of the next day’s RideLondon 100. My start time wasn’t until 8:09am, but the organisation of the event meant that my “pen” actually opened at 6:51am. So I needed to be in Stratford for around then. Trains really don’t start early on a Sunday, so for me that meant a “warm up” cycling the 12.5 miles from home to the Olympic Park where everyone was starting. Fortunately, at 5:30am the roads were empty and the sun was up. 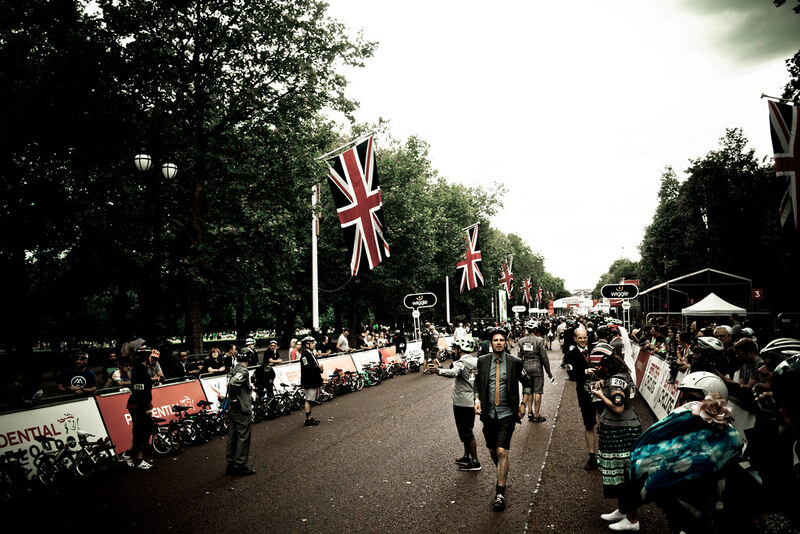 The event this year had enlarged to 26,000 riders, and with that comes lots of organisation. Each rider has a colour and a letter which correspond to start times and a barriered-off area somewhere in the park. 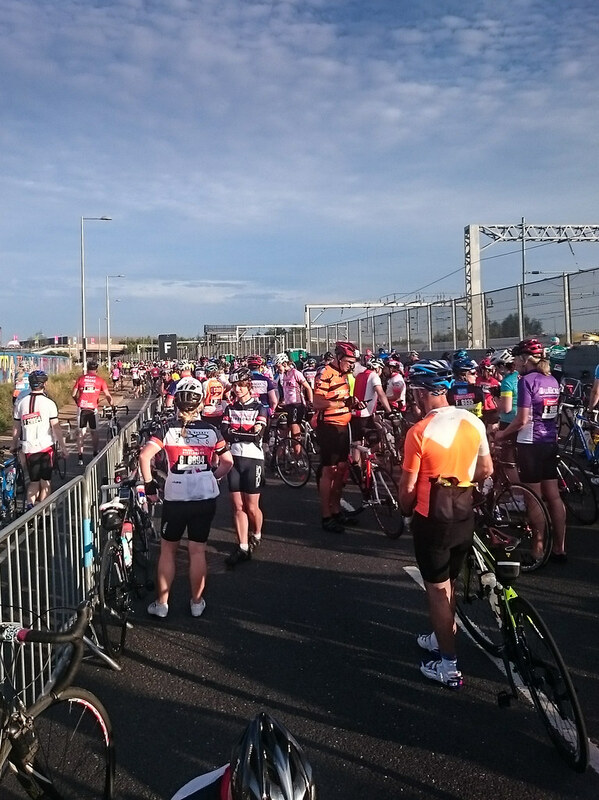 Riders are released in batches at regular intervals from 6:00am until 9:00am. So I was about two thirds of the through the released riders. Again, this was probably based on the time I said I’d do the ride in – as much a guess as anything. We slowly edged towards the start line in an organised manner. An MC was getting suggestions for start music for each batch. A wag in our group asked for “Always Look on the Bright Side of Life.” So it was Eric Idle we were hearing as we crossed the line and began. The phased release strategy means that the roads aren’t too crowded, and we were soon getting up a head of speed along the A12. Fairly soon we headed west and in no time at all had reached the Tower of London and a 10 mile sign shortly afterwards. If it was all going to be like this, this would be a piece of cake! 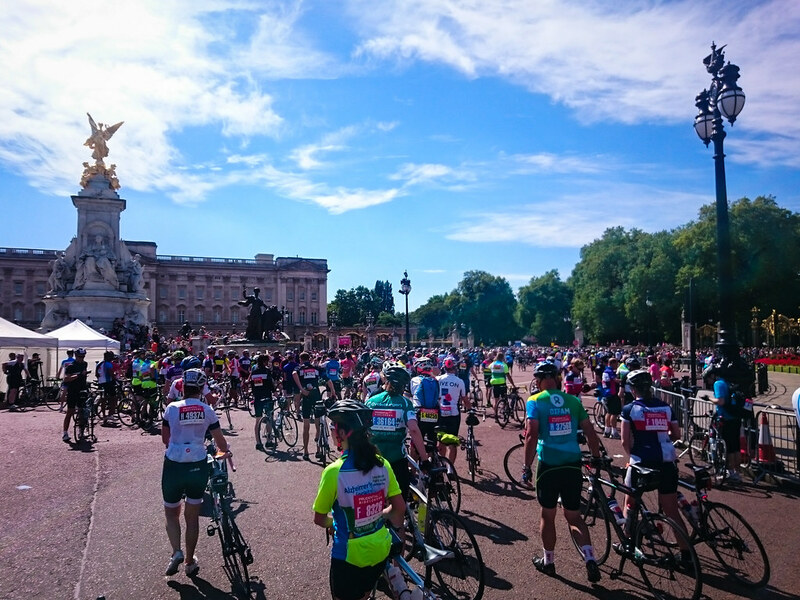 We sped through central London and I was surprised to see people at the first drinks stop. Surely they still had plenty of liquid at this stage? Then we headed westwards through Kensington and out towards Chiswick, crossing the Thames at Chiswick bridge. The roads were wide and empty, and because it was early in the morning, there were few residents trying to cross the road – which is as well, since this can be quite hard when cyclists come speeding through, although there were plenty of marshals on hand to facilitate pedestrians crossing. Then we turned down towards Richmond Park, where barriers ensured no deer would wander across our path. The modest hill in the park slowed people up a little, but it was still easy going. Then it was on towards Kingston Upon Thames – the 25 mile mark. But it was at this point that you briefly see the return route, and even at this early hour I could see riders coming back into town. As I said, faster riders were released first, so they’d probably be looking at four hour finishes. We headed along through Walton and towards Weybridge, and although I can’t put my finger on it, I began to really feel that something was wrong. I thought that I must have overcooked it a bit. 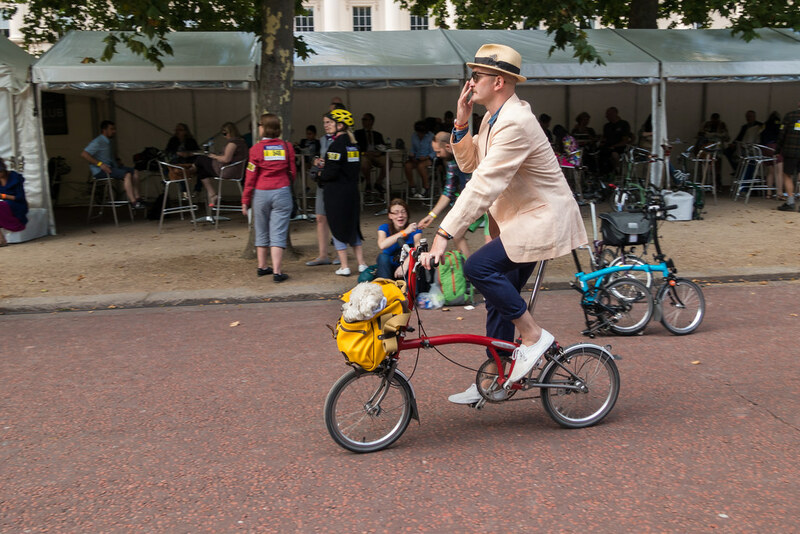 I couldn’t have recovered properly from my Brompton race the previous day, or got enough energy from food. This in spite of a large pasta meal the evening before followed up with an early porridge breakfast. But it was undoubtedly true that I was now struggling. No longer was I overtaking others, but I was being overtaken by riders I’d passed some way back. We reached a downhill section, and I was even slow on that (In retrospect, that should have been a clue, but I didn’t pick up on it). I struggled onwards, but was worried. If I felt like this so early in the ride, there was no way I’d complete the full 100 miles. I was just slogging along, my average speed slowing all the while. Then I started to feel something. My back wheel wasn’t right. I looked down and it seemed like it was wobbling a little. I kept going. Eventually I reached what I later discovered was West Byfleet. I was exhausted. I pulled in and looked more closely at the wheel. It was all over the place. And that meant that I was riding against my own brakes. No wonder I’d been struggling to reach 20kph. It was awful. Some police who were on crowd control duties came over and asked me what was wrong. I said I had a mechanical. The effort that I’d been going through meant I couldn’t really talk to them much to explain the problem in detail. One of the policemen said that I was lucky. There was a bike shop just up the road – less than 100m away – and it was open. I thanked the policeman and wheeled my bike on, and could now see that the wheel was a mess. The wheel barely turned at all. I asked a chap who was there if he could help. The wheel was properly buckled, and there was a broken spoke. He said that he could probably fix it, but it’d take 40 minutes. Or he could sell me a new wheel. In fact he’d actually sold his last spare wheel, but he removed one from a display bike and I went for that option. More expensive, but I’d be on my way sooner. He whipped my wheel out with a colleague and soon switched over my tube, tyre and Garmin sensor to the new wheel. I left some contact details, settled up, made use of his facilities (so much nicer than all the chemical toilets along the route), and was soon on the way. Thank you very much Pure Motion Cycles of West Byfleet! I can’t emphasise enough how lucky it was that I broke down RIGHT outside a bike shop! At other points in the event, I saw cyclists wearily walking their bikes with more serious mechanicals in the middle of nowhere. While most drinks’ stations did have mechanics on hand, they were at 5 mile or more intervals. You could be facing a long walk. And in any case, it wasn’t clear that they’d be able to fix, or better yet, replace, my wheel there and then. I was now, if not exactly flying, then racing along. My new wheel made a world of difference. Suddenly this was all very doable again. I was now particularly vigilant about potholes. The first notable climb of the route was up to Newlands Corner. I’m not really familiar with the Surrey Hills, so I didn’t know where I was. Had I just climbed Leith Hill? No. At the top of the climb was the second of the big “hubs” – the biggest food and drink stops. But somehow this hub was running a bit low. It only had water and energy drinks. No gels or food (which there should have been). Although I was now a bit further back than I would have hoped, I thought it was a bit poor that the slower riders were so deprived. Years earlier I once ran the London Marathon and had a similar experience of reaching drinks stops that were out of water or energy food. So the weakest runners got the least. Fortunately I’d brought enough food and energy gels to get myself around. I only really needed to top up with water or energy drink. I find that it’s worth varying your liquids. Although it’s good for you on a long ride, too much energy drink can leave a horrible taste in the mouth, and I ended up switching to water for most of the latter part of the event. Then it was on to Leith Hill proper. It begins slowly with a gentle slog upwards until suddenly the road narrows and the gradient increases sharply. I was happily prepared to ride it, but it seemed that riders in front of me weren’t, and despite many shouts to “Walk on the left,” the road was completely blocked. I slowed to a crawl in my lowest gear trying to carry on pedaling, but it was no good. I had to stop. I just couldn’t cycle through the crowd. One chap in front of me came a cropper when he discovered that too late and tipped over sideways still clipped into his pedals, and taking someone else with him. It did annoy me that people couldn’t or wouldn’t walk on one side of the road, and I suspect that this was a problem that only those released later would face. Faster riders would have ridden straight through. Fortunately it was only a few tens of metres before I was able to clip in and continue the ascent. But arguably the most dangerous part of that particular climb is actually the descent. It’s in a deep tree-lined cutting and the road surface is poor. Fortunately we were spaced far enough apart to avoid any incident. Sadly, I later learned that a rider had collapsed and died of a suspected heart attack on Leith Hill. In truth it’s not that hard a climb, so other things probably came into play. The next hold-up, oddly enough was Dorking. I think it was a “sheer weight of riders” thing, but the High Street was packed and we couldn’t all get through without stopping and walking a bit. But then it was on our way to Box Hill. This is another hill that, amazingly enough, I’d never climbed before. The surface of the climb is super-smooth, having been relaid ahead of the Olympics. The road has several long switchbacks, but the gradient is pretty constant at around 5%. While I wouldn’t say that I hammered up it, I was comfortable enough getting to the top, where the views were great. I didn’t hang around for pictures (despite having a camera, I took very few), and after refilling water bottles, I headed onwards. With 30 miles to go, it was through Leatherhead and Oxshott before reaching Kingston again, and then heading out towards Wimbledon. I hadn’t previously realised quite the extent to which Wimbledon sits on a hill, but that was a nice final little kicker, before dropping down to Putney. Then it was across the river and the home stretch. I flew along for these last miles, since I knew the roads a little better, and you could measure yourself as you passed building like Tate Britain. Soon it was up past the Houses of Parliament, up Whitehall, and then a sharp left through Admiralty Arch and onto The Mall. Everyone does their “sprint finish” and crosses the line. My timing chip time said I was slow at 7:00:28. But I prefer to use my Garmin’s timing which removes stoppages for getting my bike fixed, and drinks and toilet stops. That says 6:14:42, and even that includes some slow “moving” through drinks stations. I’d have preferred to be closer to 5:30 to be honest, and my average speed was slow at 25kph when it should have been closer to 28kph. But all things considered, given some of my technical issues, I’ll take that time, and look to go much better next year if I get in again. It would have helped had been able to ride with others, but in point of fact, I didn’t really manage to do that. There was a little of it right at the beginning, but once I’d got through my mechanical trials and tribulations, I was mostly riding solo. Overall riders were mostly well behaved, and it was clear a good proportion of the club riders were put into the early pens since there were relatively few fast “chains” coming through. A few people didn’t read about sticking to the left if you’re slower, and while riding two abreast is fine, you should ideally not sprawl across both lanes or ride three abreast. The only real issue I had was on Leith Hill where a little more consideration could have been shown. I didn’t notice too many casualties at the roadside, but there were a few, and they were not always pleasant looking. I never saw any of the causes of these incidents, but they did appear to be more towards the centre or right hand side of the road rather than the left. Overall the operation is really well handled. The release strategy is good, and aside from the foodless-hub, the event is well catered for. 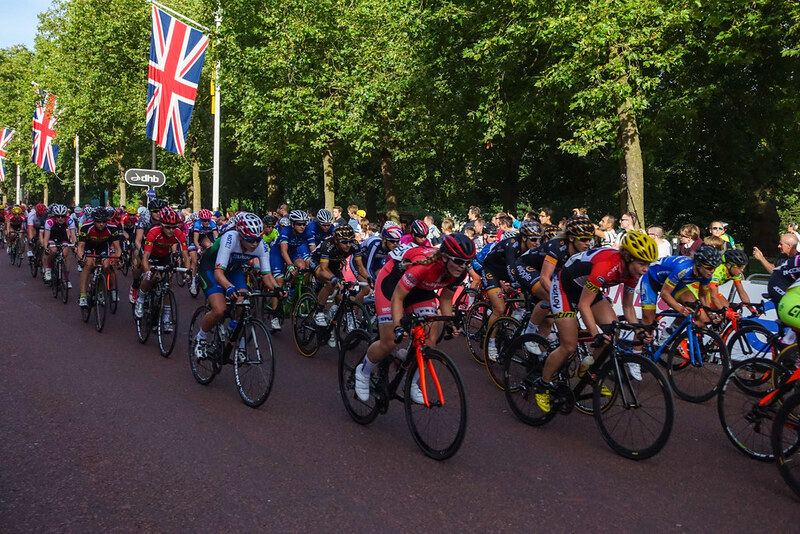 Indeed the worst part of things was getting out of The Mall and into Green Park at the end of the ride, mostly because of the hoardes of tourists heading back and forward across the flow of cyclists around Buckingham Palace. The crowds were great, especially towards the end. And I have to hand it to the charity groups who’d wildly cheer anyone in one of their branded jerseys but were generally enthusiastic towards everyone. I considered waiting around for the conclusion of the men’s road race, but decided it would be several hours until they got here, and I’d prefer to head home. The ride across London to the station gave me an immediate reminder of how great closed roads are when you’re not having to battle other London traffic. And of course, it being a Sunday, there was a bus replacement service on my train line home, so I took a train to another station some ten miles away and got a further “warm down” cycling back home from there. Then I settled down to watch the last 60km of the men’s race which was now on the roads I had ridden a few hours earlier. Kudos to whoever decided to put David Millar on a motorbike in the middle of the race. I remember Channel 4 using Allan Peiper to do something similar in cycling races years back, and I think it’s been done a little on the continent. But Millar is an excellent analyst, and putting him in the middle of things really added to what we could understand about the way the race was progressing. BMC’s Jean-Pierre Drucker beat three others to the win, including Sky’s Ben Swift. Overall a fun, but undoubtedly exhausting weekend. I’ve already entered the ballot for next year.